This page shows you some of the exchanges that we ingest data from. 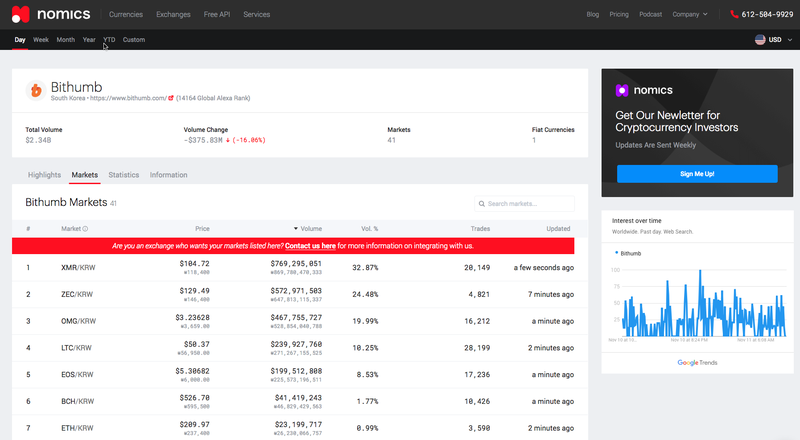 This page is the most detailed crypto exchange over page available today on any aggregation website. So if you’re an exchange and you would like to do a deep data integration to get a page of your own, and some free promotion, then get in touch. The integration is super simple and ensures that you get under the eyes of the main users of our API – institutional investors. The Nomics API now has normalized order book data available for Binance, Bittrex, Coinbase Pro, Bitfinex, and BitMex (with more exchanges coming). 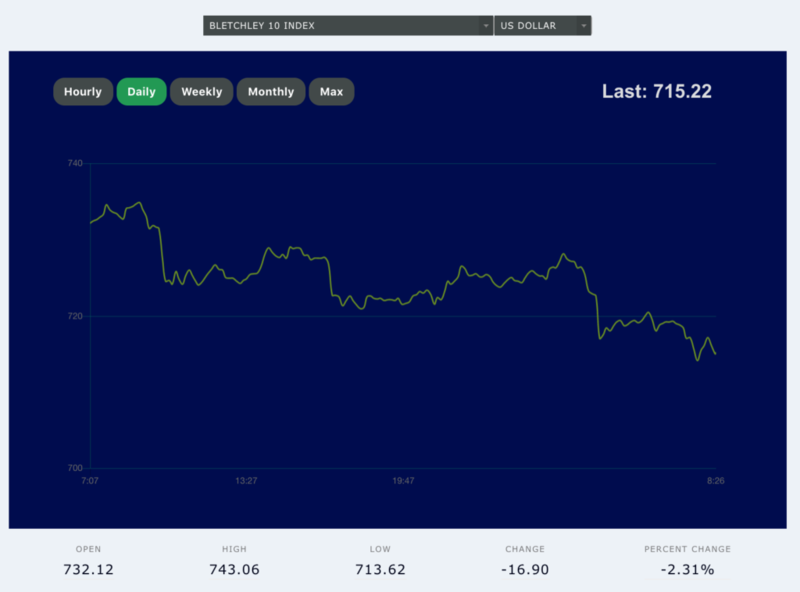 We now have a Global Cryptocurrency Volume endpoint that returns volume for all currencies summed to USD. You can now see the number of trades on the Exchange OHLCV Candles and Exchange Market Interval endpoints. We now have a currencies endpoint where you can fetch all supported currency ids. 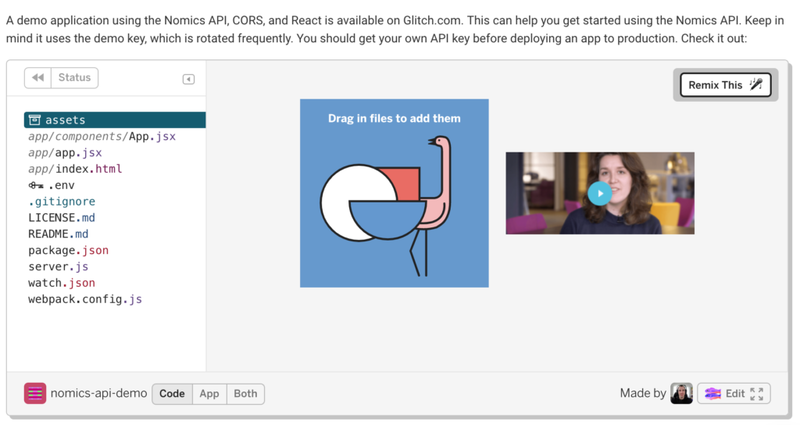 The Nomics API docs now have a built-in demo, powered by Glitch. You can remix it to easily create your own app. 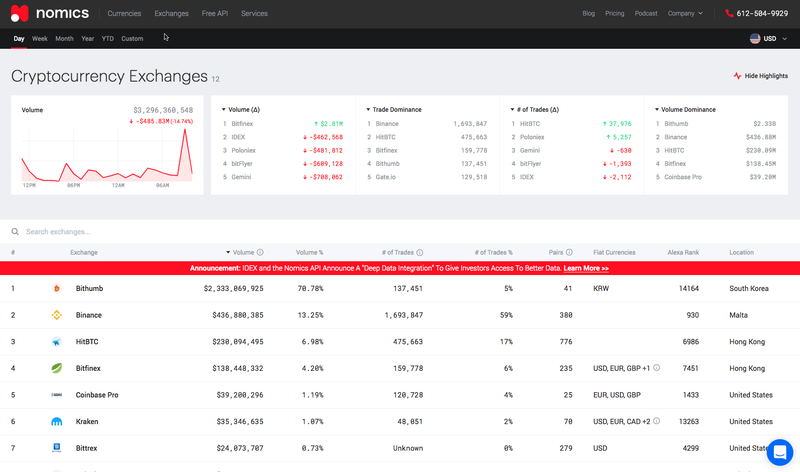 You can now filter the Markets API Endpoint by exchange, base currency, or quote currency. All Nomics’ API endpoints now filter start and end parameters for filtering by time. This includes our candles and exchange candles endpoints, currencies sparkline, market cap history, and more. Bletchley Indexes provides 8 unique digital asset indexes born from the need to figure out how the crypto market was moving. It is fast becoming the go-to platform for asset managers, investors, and traders to find accurate benchmarks and independent, up-to-date, high-quality market information. You can find out how they circumnavigated the usual ill-defined global metrics in our case study on their use of our API. TokenSoft is a SaaS token sales platform which enables clients to launch blockchain-based securities and token sales under US Regulation D, Regulation S, Regulation A+ and other international securities sale formats. They also support small businesses, enterprises, and institutions to meet compliance requirements at issuance, distribution, or exchange. Check out the case study on their use of our API. To help support our growing business, we are also growing our team. I’m happy to welcome our new members who will be doing everything possible to ensure you have a great Nomics experience. Brandon is our new creative director and product designer has joined the team, so expect our API docs, our API signup flows and website to start looking much, much better. He’s also an expert at conversion rate optimization, so if you find yourself purchasing our paid API plan when you didn’t before, his spell is on you. Tyler is hands down one of the best engineering leaders I know (we’ve worked together in the past). He joins us from target.com where he led, among other things, the creation and implementation of site-wide user tracking systems for one of the most heavily trafficked sites on the internet. So expect your feature requests to get prioritized and executed really soon. Maie is our new editor and will be overseeing our blog and more. If you haven’t been to blog.nomics.com for a while, go ahead and check it out. We’ve begun posting case studies of folks using the Nomics API. If you’re using our product in an interesting and exciting way, get in touch and let us know. IDEX (the leading decentralized crypto exchange) has become the first crypto exchange to complete a deep data integration with the Nomics.com data platform. What does this mean? 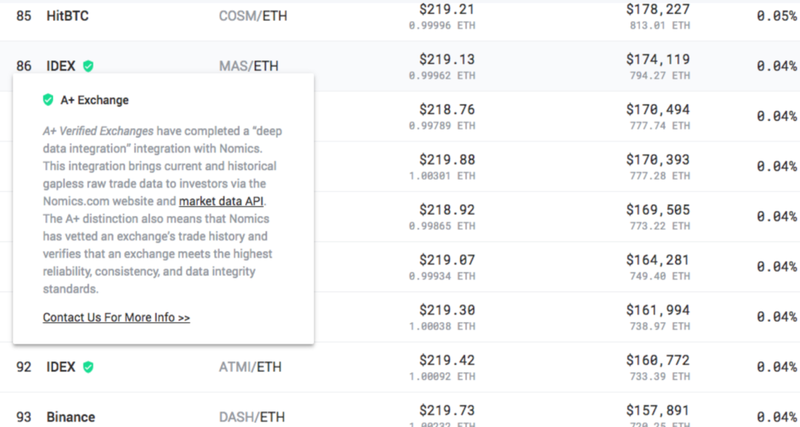 IDEX’s current and historical gapless raw trade data will now be available to investors via the Nomics.com website and market data API. IDEX will be listed on Nomics.com as A+ Verified Exchange. This means that Nomics has vetted IDEX’s trade history and verifies that an exchange meets the highest reliability, consistency, and data integrity standards. A+ Verified Exchange status is a distinction that not only comes with a verification badge on Nomics.com but also means that IDEX’s markets will be highlighted and receive priority exposure on Nomics’ website. Over 2.2 million trades, 750+ trading pairs, and 700 cryptoassets will be added to the Nomics dataset through IDEX’s integration with Nomics. You can read more about the IDEX integration on our blog. 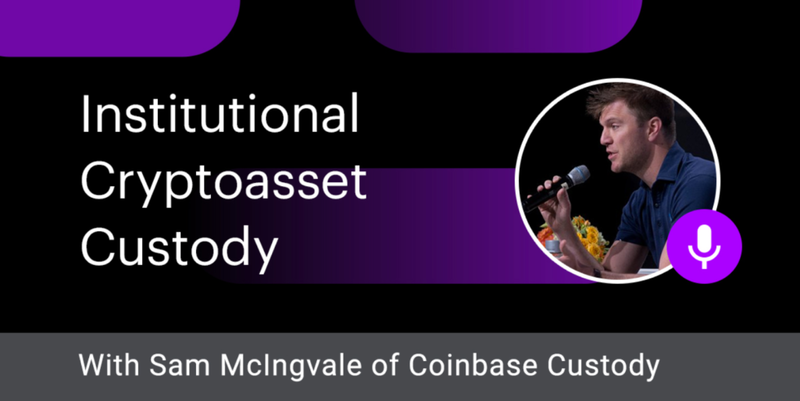 We dive deep into the issues of custody, the spectrum of options and dimensions that exist for solving the institutional custody problem with regards to crypto assets, and the suite of institutional products that Coinbase is rolling out. In this episode, Nomics’ Clay Collins and Nick Gauthier are interviewed by the creator of the Crypto Cast Network, who goes by the name of Vortex. We really enjoy Eric’s Proof of Work newsletter. 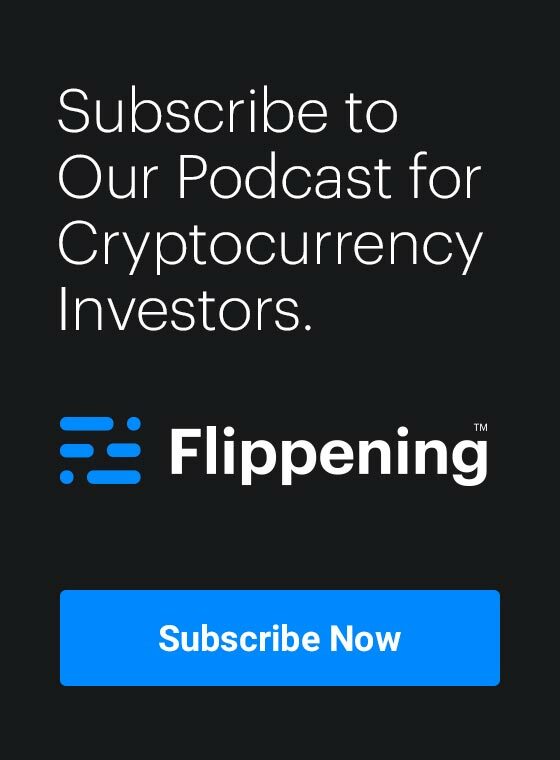 It isn’t filled with news hackery or thought pieces from Medium; instead, it includes updates directly from the makers behind top crypto projects. We asked him to do a monthly audio wrap up for us and this is the result. The dual issues of debt and lending are just too big to ignore and absolutely rife with investment opportunities. In this podcast, we break down the topic of tokenized debt and look at the history of lending. Our API is reliable, has great documentation, deep historical data, and of course, we’re here to help you with top-notch support. But don’t take our word for it, take a quick look at some of the folks who recently started using Nomics. Powered by the @nomicsfinance API. For all the data-scientists that like to work in R, I wrote an R package with API functionality around Nomics, Binance and Kraken. You can find the package here: https://t.co/OAogwdxYJp. Feel free to use and contribute to the repository. We love @nomicsfinance over here as well. All love between crypto's top data grinders. We can self-regulate with better data and transparency. We always enjoy the response we get to this newsletter and want to ensure that it continues to deliver the value you seek as a subscriber. If you have any content suggestions or issues you’d like to cover, please leave a comment below and let us know how we can best serve you. Moving forward, we hope to be producing them at more regular intervals.